The January of 2017 saw an environmental flashpoint in Delhi, when schools in Delhi were shut down for the first time due to alarming levels of air pollution. Air pollution was declared as an emergency in Delhi. It had become dangerous for children and adults to go out in the city and breathe. The concentration of Respirable Suspended Particulate Matter (RSPM), those toxic particles that go straight to our lungs and reduce our lifespan, increased more than 10 times the prescribed standard between November 2016 and January 2017. The Central Pollution Control Board (CPCB) and the Delhi Pollution Control Committee (DPCC) have been consistently monitoring air pollution levels in Delhi after Diwali. The level of air pollution reaches beyond alarming after every Diwali. The festival of joy, happiness and sweets turns into that of smoke, noise, pollution, asthma and suffocation each year. Last week, the Delhi Greens Blog shared 8 reasons why we should not burst crackers during Diwali. Now the Hon’ble Supreme Court of India has rightfully banned the sale and purchase of firecrackers in the Delhi NCR Region. “Let us try out at least one Diwali without firecrackers,” has been Supreme Court’s observation in banning the sale and purchase of firecrackers in Delhi NCR region. The Court also highlighted how the Sulphur in firecrackers is a major pollutant and the post-Diwali concentration of sulphur dioxide reaches several times the permissible level. The Court also observed how there is a consensus in the society over how firecrackers should not be used in Diwali, due to the huge discomfort it causes to the people. However, something that has been missing in the Supreme Court verdict, and in the Diwali-firecrackers discourse across various platforms is that does bursting of firecrackers a representation of Hindu culture and religion? This needs to be discussed in the light of a few Hindu leaders, and many firecracker salesman, claiming firecrackers to be an integral part of Hindu religion and culture and of Diwali. First of all, the name Diwali or Deepawali itself clarifies this festival to be the festival of Diwas or lamps (hence Diwali) and Deepa or light (hence Deepawali). The festival is neither called Patakali nor Ladili so has no reference to firecrackers. Second, while India is the world’s oldest surviving civilization, and was certainly aware of gunpowder and its properties since ancient times, it is highly unlikely that this was used for making firecrackers. This is because fire is revered in the Hindu religion and culture and Agni Devata holds an important position in Hinduism. 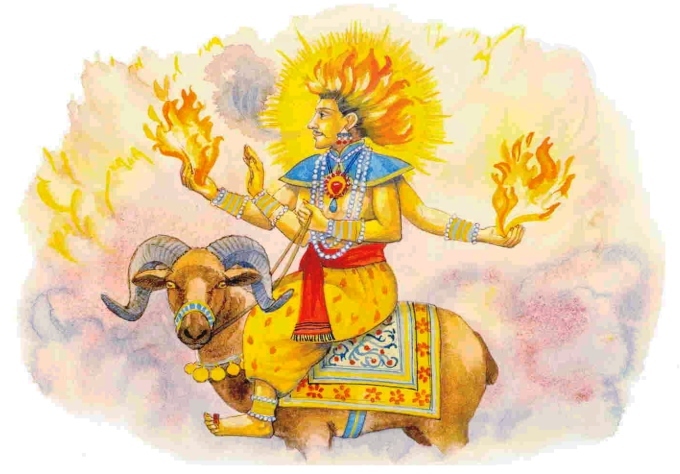 Agni Devta is one the most revered Gods in Hindu religion and functions like marriages, etc. cannot be completed without the blessings of Agni Devata. Therefore, lighting lamps for celebrating Diwali makes religious sense, but bursting Agni into noise and smoke is in fact a disrespect shown to the Agni Devata that may even bring his wrath upon all of us. Indeed such a wrath is already being felt by all of us in the form of noise pollution and air pollution. It is therefore time we let better sense prevail and stop the bursting of firecrackers, which is actually hurtful to the sentiments of the Hindu religion, a religion known for spreading the message of peace and happiness for all of humanity. Top image of Agni Devata from this source. 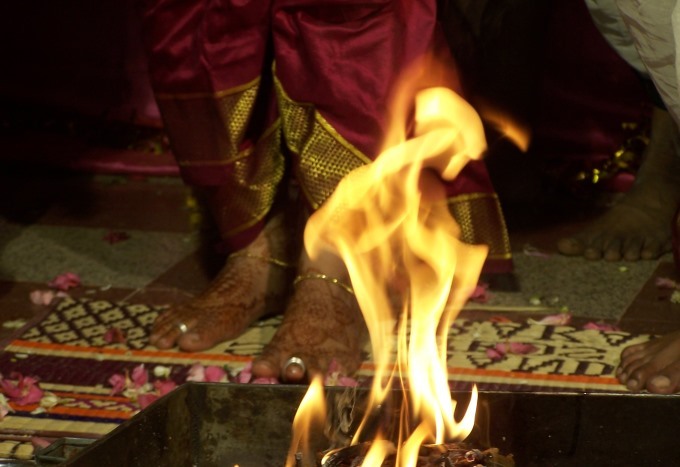 Second image of a wedding seeking blessings of Agni Devata, by Symphoney.